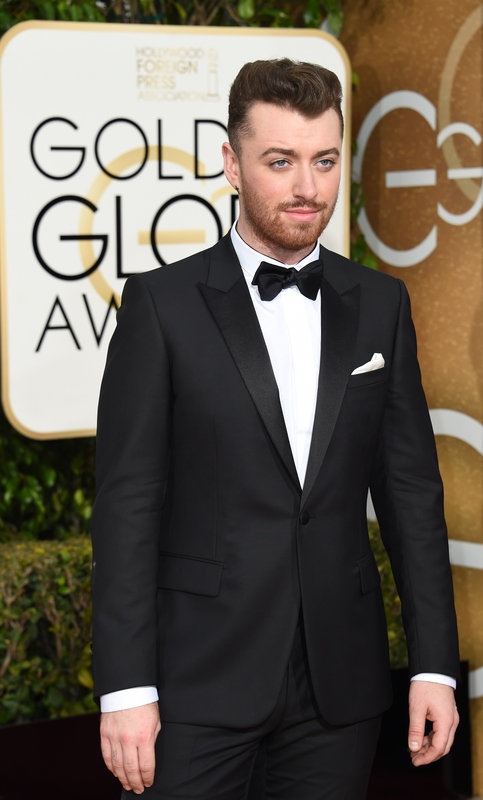 Sam Smith isn't the person you'd expect to see on the Golden Globes red carpet — he is, after all, a singer, not someone who typically needs to show up for movies and TV-based shows. Yet at the 2016 pre-show, Smith has reason to be present, as he's nominated for Best Original Song for "Writing's On the Wall," from the soundtrack to Spectre. And he isn't there alone, either. If you're wondering who Sam Smith's date at the Golden Globes is and getting very, very jealous, I have the answer — and relax, everyone, you have no reason to worry. As he explained to the red carpet host, Smith's date at the Globes is not a romantic interest, but a co-worker; the singer brought Jimmy Napes, a songwriter, producer, and singer who, as Smith said, "writes all my music." Napes is responsible for writing Disclosure's "Latch" (featuring Smith), Naughty Boy's "La La La" (featuring Smith), "Nirvana," "Stay With Me" (for which he won a Grammy), "I'm Not the Only One," "Lay Me Down," "Make It to Me," and even "Writing's On the Wall," the song he and Smith are nominated for. Clearly, this guy has reason to celebrate at the Globes. Talking to NBC, Smith explained that that he and Napes are very excited to be at the show, adding that he's "freaking out" about seeing so many famous faces but planning on partying hard afterwards. Referring to the duo as "me and Jims" (how cute is that? ), Smith said that he was looking forward to drinking at the ceremony — although, he hilariously revealed, he's "still hungover" from the night before. Here's hoping Smith recovers soon, so that he and Napes can enjoy the Globes the way all celebs should — by imbibing liberally and having a ball of a time.